Well leaving Batemans Bay this morning was a bit sad for me as I'm not sure when I will see my son Shane, daughter in law Stacey and my grandsons O'Shea and Finn again. I was already missing them 2km down the road. We decided to head home the inland way rather than the coast. The road takes you up the Clyde Mountain with is a scarey road to drive down! But seeing we were going up we weren't worried at all. Only problem was it was drizzling and foggy all the way so we had to take it easy. Because this road runs between the coast and our countries capital Canberra it was pretty busy after this long weekend. 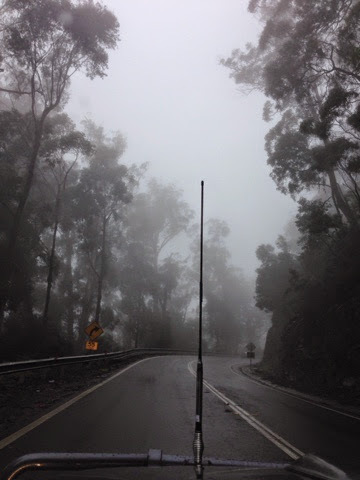 But once we got past the Canberra turn off we had the road to ourselves until we hit the Hume Freeway. Which is the main freeway between Sydney and Melbourne. Once again we were surrounded by cars!! After a drive of just over 5 hours we decided to spend the night in Albury which is on the border on New South Wales and Victoria. We are staying in a cabin in a caravan park we have stayed at a few times before. After leaving Batemans Bay on a 13c morning the day turned into a delightful mid 20c's but the wind has just turned cool and picked up so we may have a bit if rain tonight. So on that note I will say goodnight. I would love to hear your comments. I have lots of passions one being travelling around Australia in our Camper trailer named "Myrtle". We are now on our Aussie Adventure Part 3. . I would love to have you join in on my travel adventure and also my other passions which are my family, my jewellery business, my crafts and anything else that takes my fancy. You are most welcome to come along for the ride. How did your Week 2 Go?